Whether it be sailing round the islands, laying back on your luxurious yacht soaking up the sun, snorkelling, diving or fine dining on board or in local restaurants, Sayang´s crew will tailor an itinerary according to your wishes. Mike always had a love for water sports. While studying in Cape Town his interest in sailboats evolved. After finishing his degree, Mike began his yachting career as Deckhand on a 45 day passage from Cape Town to St Maarten. This experience had him hooked and he proceeded to work on different boats around the world. After obtaining his RYA Yachtmaster Offshore (for both motor and sail boats), he skippered 2 boats simultaneously in the Med. Sailing boats and the adventures that ensue is what drives Mike´s passion for the ocean. He holds RYA Yachtmaster Ocean and AEC Engineering Certification. Whether you´re interested in sailing, diving, snorkelling, fishing, hiking, discovering uninhabited islands, or just simply relaxing in one of the most scenic tropical destinations in the world, Mike and Kristyna will tailor an experience to your desires. 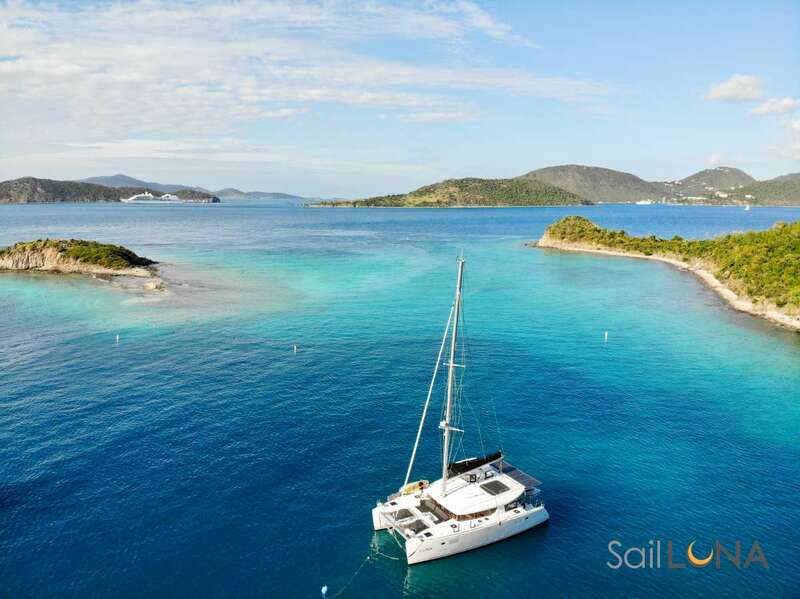 Kristyna and Mike look forward to having you aboard Sayang and showing you the best that the Caribbean has to offer. Send us an inquiry to get specific pricing for Sayang. The boat was beautiful inside and out. The accommodations were comfortable and clean. The food was delicious and HEALTHY! Cheers to Kristýna for making exotic and healthy meals in that little galley. Fresh baked bread. Turkey dinner for Christmas and sashimi from fish we caught! Beautiful from Tortola to Anegada to Jost Van Dyke and points in between 116 nm covering in 7 days! Thank you for a wonderful week. You guys are the perfect hosts and made us feel like family. Every day was special. The activities were very well aligned with our active lifestyles. The sailing was so much fun. You have a beautiful boat and should be so proud of it, ´Our next boat´. The meals were excellent. Your presentation and meal design was excellent. Delicious! You are the friendliest and nicest people to spend vacation with. We wish you all the best and hope to see you again! Mike and Jemma, thank you for teaching me the ropes of sailing, letting me take the helm, pick up some mooring balls, and giving me an unforgettable spring break. I now hope to continue both my sailing career and wakeboarding career throughout life.. I sincerely hope we run into each other on the water in the future. Thanks again! Ps- If you ever need a deckhand please don´t hesitate to call. Sailing with Mike and Jemma on Sayang was wonderful. The boat sails beautifully, the meals were delicious (thank you Jemma! ), and Mike was an amazing guide to the life underwater - the best snorkeling experience we have ever had. We can´t wait to sail on Sayang again. We had the very best time and can´t wait to come back. Great fun, snorkeling, delicious meals - Huge thanks to Jem and Mike - Dream Team! A boat that sails like a dream. Two people, Ratna and Paul, who make the dream come true. Attentive at every step, from delicious food, to careful helpfulness in and out of the dinghy, they made Sayang and the BVI a joy. Getting to know each of them was a pleasure. This trip exceeded my high expectations. Many thanks for your pleasant hospitality, sailing expertise, and great cooking. Thank you making our first BVI trip one to remember! And thank you for your patience with our lack of nautical knowledge J. All of the snorkelling plus stories were fantastic. It was a fantastic vacation - thank you! Thanks for a great experience - taking us to beautiful islands and snorkelling spots, pointing out the turtles, the dinghy rides, the great cooking, and allowing Marshall to take over your kitchen every night. It was our first sailing experience and we enjoyed every minute! Three cheers to you both for giving us a perfect sailing vacation and lively conversation. Thank you both for such a wonderful week in the BVI! It will be memories as a family to last a lifetime. You were such welcoming and accommodating hosts on your Sayang. We loved seeing all the different islands and their unique treasures. Your stories and knowledge were awesome. Thank you so much for what has been our best vacation ever. Everywhere we went was so beautiful and made even better by all the descriptions of its history. The boat was also great, and the food was especially good. Thank you for being such amazing guides the entire time, pointing out the best snorkelling spots especially. Thanks so much for an amazing week in the BVI! We had a blast sailing and snorkelling, seeing beautiful islands and hearing about their history and more recent events. What a terrific way to experience the BVI! I have been dreaming of such a vacation with our family and we could not have enjoyed ourselves any more. Thank you both for sharing your sailing expertise and cooking talents. What a fantastic time we had! We cannot thank you enough for everything you did for us! The Sayang is without doubt the most beautiful boat in the BVI! With the best captain and chef! Thank you so much for helping us find turtles! Trip of a lifetime! Thank you very much for a wonderful week sailing in the beautiful BVIs. You are lovely hosts, enjoyable companions, and a consummate professional sailing team. We always knew we were in good hands. Ratna, your meals were delicious, particularly your wonderful Asian curries. Paul, we learned so much about the islands, their history and inhabitants. Thanks too for the sailing lessons. It will take a few more trips before we are confident on our own, but we enjoyed our time at the helm. Lovely getting to know you both. Thanks for giving us a wonderful 25th anniversary trip. Thank you for so very much for providing such a memorable and outstanding sailing experience for our family. In the sun and the rain, in the wind and the calm, we all created memories we will cherish forever! Ratna Yum! The food you prepared was excellent and Paul your navigation and recommendations for island hopping, snorkelling, etc. were greatly appreciated. Thank you. We enjoyed sailing with you. Thank you so much for sharing your islands with us, and your beautiful boat. Our family will cherish this holiday. Thank you so much for an amazing 9 days aboard the beautiful yacht Sayang! We have loved every minute of it, and your knowledge, skill and professionalism played a big part in that. Ratna, the food was wonderful and you did a brilliant job in catering for one vegan and one non-vegan! I think we all discovered some new favourites! Paul, your knowledge of the islands is superb and we really appreciated the quiet, beautiful and calm anchorages you found for us. See you soon! Thank you so much for the fantastic trip and tour of the beautiful BVI. Of course the food was exceptional and your company also! We loved your malay flair with the meals. Good coffee and good beds!!! Unforgettable is an understatement. I have been wanting to do this for years and I could not have imagined a more perfect trip. Thank you for a wonderful trip. It has been a trip of a lifetime that I will never forget. Every meal was a fine dining experience. So many things stand out about this trip! Our family made some incredible memories here with you and your beautiful boat! The food was so very good! The hospitality was first rate! But I think one thing that really stands out for me is how passionate you are about your work, this boat and these islands. Purists is the word that comes to mind. This was greatly enjoyed by my entire family but very much appreciated as parents of young children. A great example! Thank you, come visit us in Houston! I will try to make a short list: amazing food, awesome bedrooms, high luxury, outstanding crew. Obviously hands down best vacation ever, etc., . I absolutely loved the pace. Nice to take a break from the busy schedules. Loved the destinations and activities, but my favourite part of the trip may have been the food. How Ratna made all of it in that kitchen amazes me! Ratna and Paul were so sweet and helpful! Gonna miss staying on the boat! Thanks Paul and Ratna!! Thank you both for a wonderful experience. One week went by very quickly. You both are great hosts, passionate and very friendly people. This was my first sailing experience and I enjoyed it thoroughly. Ratna, you are a great host, excellent food, and very caring. Paul, I was very pleased with your passion for sailing and patience. Overall, it was a great experience. Definitely want to bring my family sailing. I would recommend you guys to anybody who wants a sailing experience. Sayang,,,, Sayang is a name I will never forget. I was in the BVI before, but I never saw the BVI before. Paul and Ratna exposed all the hidden beauty. Ratnas cooking was incredible. Pauls seamanship is equally superb. Swimming and snorkelling every day and the food, did I mention Ratnas cooking? Watch out for the Suzy fish!!! Sayang! Outstanding and unforgettable. Paul and Ratna are so passionate. We were always looked after and made comfortable. The food was beyond expectations. I very much appreciated the opportunity to take the helm t/o the entire trip. And thank you for showing us the BVI gems. PS did I mention I went to Harvard! Thank you so much Paul and Ratna for such an amazing time. A very special thank you for keeping my anxious mother sane - not an easy task! Your food and hospitality was more than I could have ever asked for, and I will miss every minute of this amazing adventure! Thank you again. Thank you for taking such good care of us! We had a marvelous time-eating Ratnas delicious food, listening to Pauls endless fascinating knowledge of all things BVI, and of course sailing, swimming, and snorkeling. We had a tough time getting here (late by a day) but you made it all worth it! If you are ever in Boston, you have a welcoming place to stay we would love to reciprocate! Thank you thank you for everything. Thank you Paul and Ratna! It has been a wonderful sunny week here in the BVI! The food, sailing and beautiful places have been so enjoyable. You have made this a great adventure. Thank you again! Thanks to Paul and Ratna for providing us a lovely and thoughtful sailing experience. We loved your boat and your company and it was great fun exploring new places with you. Thank you Paul and Ratna! You were kind, funny, accommodating and great hosts. We loved hearing about the history and geology of the islands, not to mention the fantastic food and anchorages. Very much appreciated. Thanks to both Paul and Ratna for a wonderful trip. The food was fantastic, the weather was great, and minus the first day (for me) the sailing was awesome. It was fantastic. I am the granddaughter of a pilot and am not comfortable on the water. I married a man who grew up on the water - sailing, water skiing, fishing, surfing. You have turned a reluctant sailor into someone who appreciates the beauty of the water and the sailboat catching the wind. Paul, I appreciate all the history you taught us about the islands and the capable way you handle your boat. Ratna, your cooking was amazing. It made the boat seem like a luxury hotel. Thank you both for sharing your home with us and for helping us make some amazing family memories! Please call us if you ever visit Texas. Paul and Ratna, This was a bucket list item for our family, and you both made it all that I had hoped it would be. It made a huge difference having such an experienced, competent, knowledgeable and educated crew, with whom we had many interesting conversations, and in whom we felt well taken care of. Thank you for sharing your beautiful home with us (the boat and the BVI). Please get in touch with us if you are ever near Houston. Cast up my lucky blue hat. Tortola? No-News-Norman, O lose the night quiets on to the Pillar of Salt. Thank you for making our first family experience on a yacht SO amazing! Teaching us to helm, the history and stories of the B.V.I, special places to snorkel, things to see, putting up with certain fears of jellyfish and sharks! Endless patience and good humour. Hope to see you and Ratna in Northumberland. We loved seeing the pod of dolphins and canoeing with them - very special and magical! Thank you for our sailing lessons - a patient teacher! We loved the en route history lessons! Thank you for listening to our style and creating an amazing experience in the BVI. Quiet anchorages, beautiful sunsets, peaceful sails, fascinating snorkeling, and intellectual conversations! Thank you so much for a wonderful time and great adventures. Loved our great meals. Thank you again. Thanks for showing us all the beautiful islands of the BVI. Loved all the inside scoops. Food was great too! Had a great time. The last day of the greatest vacation ever. Reflecting on the highlights. Feeling like we experienced all the BVI has to offer, while knowing there is so much more. When we return, it will only be with Paul and Ratna, as it was the crew that made the vacation. Though we don´t have experiences to measure this by, it would be difficult to imagine a captain more focused on providing an experience of genuine pleasure. We were continually in awe of Ratna´s ability to create fine dining out of the air. We all agree that meals on the boat were better than meals on shore - which were also delicious. Thanks to Paul and Ratna for making the BVI the BVE (Best Vacation EVER). We had a family vacation we will never forget. It truly was an experience above our expectations! With only one true person with sailing experience the other three of us were a bit nervous about a week of sailing about. We neednt have worried. Sailing is truly a calming, zen-like, serene experience. I especially loved sitting and watching other boats, the sky, and feeling the warm breeze. Ratna, your kind , calm manner made life easy and comfortable and I am so grateful and appreciative of your delicious meals, that helped make it a true holiday for me too! Paul is charming and entertaining and we were grateful for his knowledge of the whos who in this part of the world. This holiday ranks right at the top for our favorite holiday. It is certainly a wonderful way to see the other islands of the BVI, and we would have missed so much had we just stayed at a couple of resorts on two islands. Thank you for sharing your home with us, it was an honor. The Sayang truly is a sweetheart, in any language. Thank you for the wonderful sail thru the BVI and to Anegada. The meals were terrific . We enjoyed our vacation very much. Thank you for the wonderful meals and scenic sails. I was the only one of all of us that had never experienced sailing and you set the bar very high as a first time experience. Thank you for all your efforts. We had a lovely time. Thank you for one of the best family vacations we have ever taken. From your extensive knowledge of the islands to your willingness to adapt to our changing wants and needs, this has truly been idyllic. We had a great time, while also knowing that we were safe and well taken care of the best kind of family adventure! It was great to have the time and space to know you two, as well. It is easy to see why this as lasted as long as it has you are an amazing team. And finally, thank you for a last night we will remember forever! If Al ever puts out a new CD, we will buy a copy! Vi ringraziamo per questi giorni passati in allegria e tranquillita. Ci avere portato in posti indimenticabili che porteremo con noi. Grazie di tutto e buona continuazione, riserberemo un bel ricordo di questa vacanza. Anche grazie a voi che siete delle belle persone. We thank you for these past days spent in joy and peace. We have been taken to unforgettable places. Thanks for everything and good continuation, we will treasure the good memories of this holiday. Also, thank you for being nice people. You gave us our first exceptional sailing trip. Thank you for your hospitality, graciousness and kindness this week. You kept us safe and intrigued and Dan got his fix at the helm. We certainly hope to see you again! What a wonderful experience!! This was my first time in the BVI and I cannot think of a better way to see such a gorgeous place than from this beautiful boat. Memories that I will have forever. Thank you for hosting us in such grace and style. One major shout out to the creative deliciously prepared food. Each meal was better than the last. My first trip to the BVI and it will not be the last. My sincerest thanks for making it so very enjoyable. It has been an amazing week traveling the islands and full of great food, great fun and memories of a life time. Thank you for sharing your home with us. What a fantastic week! I will remember your kindness, your expert sailing, your gourmet meals, your excellent itinerary, and your great patience! I am departing with extra-ordinary memories. Its been a dream travelling the BVI with you and you have been fantastic hosts and guides showing us the most amazing places and spots. Even though we have been miles and miles away from home this has felt like home in paradise. From the bottom of our hearts, thank you! This week has been memorable and we enjoyed ourselves every minute. The sail to Anegada was amazing. Thank you for taking us to all the islands we wanted to check off our list. Ratna, the curries were delicious. Paul, we enjoyed hearing about all the history of each island you were a great tour guide. The snorkeling this week was the best we have ever seen! We even saw some dolphins at Jost. Thank you so much for all of the wedding ideas, hopefully we will be back for the big day. Thank you again for such an amazing vacation filled with lots of adventure and relaxation. It is difficult to capture how much fun we have had on Sayang in just a few short lines. We can only say thank you very much for sharing your wonderful home, beautiful backyard and the best restaurant in the BVI. These islands are truly special. Seeing them from Sayang was a remarkable experience. We will remember this vacation always. Thank you so much for helping us rediscover so many of our favorite places and experiences in the BVI! It has been a fabulous week! Amazing meals, gorgeous sails, snorkels and sunsets, and your thoughtful and interesting company. It has been a real pleasure getting to know you both you are special people! Please stay in touch well hopefully see you again very soon! Olivia and I had an amazing time on your beautiful boat. Thank you for allowing me to revisit these islands that are so close to my heart and giving me the perfect opportunity to share my childhood memories with Olivia. I will always remember this as one of the most special trips I have ever taken! I was an absolute pleasure to meet you both during this marvelous week. Thank you for such a fun week! Thanks for bringing us to such beautiful snorkeling spots and for the incredible food (I especially liked the curries!). This has been an amazing first experience in the BVI and on a sailboat for a week! Thank you so much for your graciousness and hospitality! Your local knowledge and stories enhanced our experience tremendously! The meals were wonderful. We so appreciate you both and will recommend you to others. We will (hopefully) be back. Please come see us in N. Carolina any time! Thank you both for a wonderful vacation! We appreciate all you did for us even when the weather was not ideal for sailing. We enjoyed our time aboard Sayang - a beautiful yacht. Ratna, the meals were the best! April 26th, 2014 Best Birthday Ever! From the bottom of our hearts, thank you for making our experience in the BVI s so special. We think the world of both of you! Thanks for preparing for us on such short notice and showing us the beauty of the islands. Thanks for all of the thought you put into every day the delicious cooking, memorable anchorages, and your patience throughout the entire trip. We enjoyed talking with you and hearing the history of this beautiful area! We will never forget our trip with you and we both hope our paths will cross yours again in the future. All the best in the future to you both! Thanks for an amazing journey! Thank you for a great week. You have a beautiful boat and we enjoyed sailing with you. Thank you for great dinners, conversations, trips around different islands and snorkelling tips. You have made our vacation very special and we are grateful to both of you. As so many other guests have said: AMAZING! The food, the snorkeling, the BVI all amazing! This was Barry and mine first voyage and we love sailing! I cant think of a better vacation: the two of us who never relax relax we did! You were both charming, confident and just wonderful. Thank you for sharing a part of us with us. I cannot believe all of the great experiences that we were able to fit into this week, yet it was such a relaxing experience. We loved staying on your beautiful boat Sayang and exploring the BVI. We had great sails and some really good snorkels, thanks to your intimate knowledge of the islands. Ratnas cooking was amazing, with every meal a gourmet feast. Even with a couple of not so adventurous eaters, she managed to please. It will be a hard act to follow once we get home. Thank you for a great, special vacation for us all. It is one we will not forget. You both were so warm and welcoming, it really made for a memorable experience. We also appreciate you keeping us safe while having fun. Such a wonderful week. Exceeded all our expectations. Paul was an exceptional captain who schooled us on being good sailors. Ratna was beautiful inside and out and we all appreciated her meals and great personality. Looking forward to our next visit with Paul and Ratna. Thank you Paul for always making us feel safe and Ratna for always making us feel comfortable. The local knowledge was great and made our trip so much richer. Thanks for helping create memories that will last a lifetime We loved the BVI! Thank you so much for a fantastic, and most of all relaxing week. The weather was beautiful, the food exceptional and the sites unimaginable. Thank you both for being such brilliant hosts and for allowing us to share your wonderful home Sayang. What an amazing week! We saw so many parts of the BVI. Paul and Ratna´s knowledge of the area allowed us to get the most out of our 5 day sail. We felt so safe and so well taken care of every day. Sayang is so beautiful - we loved spending time on her. Ratna´s cooking is wonderful too! We are leaving (regretfully) with special memories. A couple couples from Atlanta escaped an ice storm for 85* weather in a beautiful environment on an exceptional vessel! The hosts were so helpful, caring, knowledgeable and fun! We have memories for a life time and are so glad this week was part of our lives. Thank you Ratna and Paul! What a fabulous week!! Paul and Ratna were so welcoming and comfortable to be with very caring and attentive. We learned so much about the islands and saw so much that was breathtaking!! Ratnas attention to our preference sheet was amazing her meals were absolutely yummy. Thank you for everything. Thank you so much for taking us sailing! We loved your beautiful boat and exploring all the wonderful places you brought us to each day. Thank you for the delicious food and drinks and taking such good care of us! Thank you for a wonderful experience! Thank you for the wonderful experiences here on Sayang. It has been awesome! I have never been to a place with so much interesting history, or such gorgeous water. It would never have been possible without you guys! Travelling in the Caribbean has been quite an experience for me. Most of all, I enjoyed talking to both you and Paul. But notably the food was excellent as well! Thank you Paul and Ratna. That guy who came with those people from that place. Thank you for a very beautiful holiday on board of Sayang. Good professional sailing even in strong winds. Excellent food served with demanded excellent wines. You took 3 Danish sailors with storm and the Vikings are coming back. Thank you so much and see you soon. Thank you because you make a difference for us. We enjoy the sailing and the time. You are so professional and special and nice. We will never forget this trip on board of Sayang. We had such an incredible time discovering the BVI. You took us to some of the most beautiful beaches we have EVER seen and clearly have a fantastic knowledge of all of the islands! This trip has been everything we had hoped for and more! It is certainly a week we will never forget!! What a fabulous week! We feel so blessed to have had such a beautiful boat , but more importantly such an accomplished and knowledgeable captain and also a crew (Ratna) who is not only an accomplished chef , but would be a friend. Our family gave us the prized boat on the flotilla for which we quickly knew why. Thank you for your patience as it was not an easy U.S. group to organize with all of the various interests. You managed it with grace and patience and lots of laughs. We may be your last flotilla, but all enjoyed it thoroughly. Thank you! Special thanks for also letting Jim get in his sailing fix. He learned so much! We also now feel much more accomplished in our snorkeling techniques and BVI trivia. Ratna has the patience of a saint as our children and nieces and nephews would love her food so much that she would have to serve us a few breakfasts every morning. Thank you for a trip of a lifetime! We look forward to organizing our family and a few friends next round. Kathryn and I had a great time on your boat and with you. Also the food was very good. We love going snorkeling and seeing all the beautiful fish and coral. Thank you so much! Thank you for providing the perfect way for us to celebrate our 35th wedding anniversary! You are true professionals who anticipate and provide for every need (or want). We cannot say enough about the superb food breakfast, lunch, and dinner!!! You are gracious hosts, wonderful teachers, fine entertainers, and great human beings. Thank you for sharing your home and your part of the world with us. It was an amazing trip. Thank you both so much for a wonderful and memorable week on board your beautiful boat. I am so glad you talked us out of following the guidebooks and instead took us off the beaten track to some truly spectacular places. Snorkelling at Cooper Island and Mountain Point was the best we have ever experienced. Paul thank you for some great sailing, sharing your knowledge of the islands and for ferrying us around in the dreaded dinghy! Ratna we were constantly impressed by every meal you are a wonderful chef! And the wine choices have been superb. We very much hope to be back! Wishing you fair winds and calm seas in your little slice of paradise. Thank you for your great hospitality. We enjoyed our beautiful sailings as we toured the amazing islands. To Ratna - your culinary skills are fabulous - truly enjoyed all our meals and drinks. And Paul - your sailing skills are truly amazing! Though perhaps a bit more dangerous, sir? Thank you, Paul and Ratna for sharing your beautiful boat, your stories and part of your lives. We have had a wonderful time, perfect weather, lovely quiet locations, and fabulous food Ratna! You managed to put up with early rising parents and late night teenagers. We are bringing home very fond memories of a special vacation! I loved the long sails and calm quiet nights on Sayang. It was the perfect vacation! Thank you so much for taking care of us and I hope to make it back to the BVI someday. I had a great time staying with you on Sayang. Someday I might live on a boat myself! Thank you so much for your hospitality and kindness. One of my best vacations yet! Thank you for your generosity and love throughout the entire trip. This has been one of my most memorable vacations thanks to you! Hope to see you soon and I wish you the best. A wonderful delicious week was had by the four of us. Your beautiful home was welcoming and perfect. Ratnas food was as good as any fine restaurant. We loved Pauls command of the water. The trip was everything we thought it would be and more. We will always remember our birthday celebration. We decided to take a 10 year anniversary over the New Year (2012 to 2013) in the BVIs where none of us had visited before. Your internet site convinced us this was our boat and our chef and captain. That proved to be the right choice for us, very soon. Kirsi, Linnea and I have enjoyed one of our best vacations with you! We love sailing and need our sun in the middle of the long dark Nordic winter and we sure got what we ordered! During the week both Ratna and Paul thoughtfully tailored every day or even every minutes program to suit our hopes and even smallest needs. We also met Ratna and Pauls nice friends Mark and Gillian with their girls Amanda and Olivia who got along nicely with our Linnea (7 year old) at the poolside at Bitter end as well as on their boat. Pauls impeccable experience of the water, anchorages and weather patterns proved to be of great value to the success and relaxation of our vacation. Sayang is truly a great yacht and in extremely good condition and the best kept charter yacht on the market I am sure. Ratna kept an incredible detailed and constant eye on what we needed, even before we realized our needs ourselves. She is truly a master chef and we loved everything that she served us throughout the week. The snorkeling at Mountain Point, Cooper Island, South Sound and Salt Island was excellent and unforgettable. Thank you Paul and Ratna for an amazing week! From a family of rookies! We could not have felt more safe in such a beautiful and awesome place. Paul your captain expertise made Beave and I feel so comfortable with our 4 children aboard. Ratna, your calm voice and talent in the kitchen provided a week of pure bliss. We will never forget this family adventure. Thank you for everything. Remember us in the snow. We had a plan to relive some of CARIB experience and you guys made it possible. The week could NOT have been better no complaints only accolades!! You both gave us a wonderful and memorable cruise - and thank you is not enough but we do thank you our new found friends. Hope we see you again! We will return if you will have us. Paul insists that I can write something nasty in here, but I have absolutely nothing nasty to say. Thank you for an absolutely wonderful week of sailing, shelling, and snorkeling. Your knowledge of the islands is incredible! Thrilling sailing in 32 knot windsflying fish,...THE perfect beach twice over Ratnas epicurean delights from the worlds best French toast to delectable fishracing and beating Invictus... Pauls patience in joining us in cardsfinding ideal snorkeling spots and secluded anchoragesescorting us to Als superbly entertaining musical performancesharing your musical repertoirepatience, humor and nautical skillsah yes, even finding turtles! Your beautiful and exquisitely maintained sloop has been a relaxing and happy home for us this week. THANK YOU! And thank you for arranging meteor showers on a moonless night Best place I have ever watched stars! PS too bad we missed Throw Away Wife Bay! What a beautiful boat, we had such a lovely time. My Dad was looking for a relaxing time and that was exactly what we got!! Thanks for taking us to all those places for me to do a bit of scouting and pointing out other places for me to look into (Vicki is a wedding planner). It was really an amazing experience for my sister and I that I know we will never forget. Sorry we missed Ratna, but Ann was great! The food was amazing. You both knew so much about the BVIs and we all learnt so much on this trip. Thank you so much. Vicki, Rebecca and Steve . PS Paul is a great photographer! Thanks so much for the great and memorable adventure on the Sayang. The food was wonderful. The weather for sailing was not with us, but we had many great snorkelling times. It was a delight to meet Conrad and take the walk on Peter Island. Thanks again and wishes for many years of smooth sailing! Iris, Stan, Tony, Gina, Maggie and Dave. Thanks for a really wonderful trip on a fantastic boat. The Sayang is truly beautiful! Thanks for all your generosity and taking such good care of us. We had a great time! What a wonderful experience! Paul and Ratna, you made our family feel so welcome aboard the Sayang,. Such patience with three rambunctious boys. Your food was truly amazing. It is hard to believe the magic you make in that small kitchen. Your boat is so comfortable only wish we could have stayed longer. Thanks again for everything this has been a trip we will never forget. Thank you so much for this amazing trip, I had the greatest time. Paul, thanks so much for taking us out almost every day to go explore the islands and taking us to all the great beaches. Ratna, thanks so much for putting all of your time and effort into our meals, they were amazing! I had so much fun in the islands! We jumped off the boat and I did a flip. When we went snorkelling, Mom and I saw a reef shark and I found a conch shell. My mom did not let me keep it and said it was stinky. Max my brother got me a coconut and I drank the water out of it, The food was awesome! P S the Baths were cool. I got to swim in the water inside and almost got to jump off a rock! We saw a sand shark when we were snorkelling at Peter Island. The food was good to taste. I want to live here on the boat. The boat was so cool, there are bedrooms. Thank you so much for a wonderful sailing experience in the BVI. Thank you for letting the boys practice their skills by helping you with some of the sailing. Paul you picked great snorkeling spots for us. Ratna, what can we say about the food? It was so good! Kevin could not wait for each meal. You both made us feel so welcome and comfortable in our home away from home. Ratna, I hope you survived Dougs graceful fall off the dinghy. We hope to be able to come sail with you again. Thank you for everything!! Thank you both for a wonderful sailing vacation! We could not have planned a better itinerary for our BVI Island tour. Ratna, the food was fantastic! And you made us feel so comfortable. You are just a delight! Thank you Paul for all of the sailing instructions. I am sure it will come in Handy in Kansas! But seriously Paul, your expertise at sailing in all conditions was amazing. It actually scares me to think what kind of captain we could have ended up with had we booked a different tour. You are extremely knowledgeable about the BVI and I could not imagine missing this opportunity. Thank you both very much! What a wonderful vacation, we could not ask for anything more. Locations we went were perfect. Food was amazing, Ratna is a sweetheart. Paul knew so much about the islands and is such an excellent sailor, we totally felt safe in his hands. We asked for suggestions and everything they recommended was just perfect, from snorkeling spots, to scuba dive company, to nice quiet coves. Would highly recommend this charter to anyone of our friends. Thank you so much for a great vacation. Thank you so very much for introducing us to the BVI! We felt very safe onboard, and very well fed too. Going up the Sir Francis Drake Channel was a great thrill. Anegada was terrific, but we think Marina Cay and Scrub Island was the most fun. Ratna, thank you for taking me to the Spa on Peter Island. Thank you, once again, for providing us with a perfect holiday! Expectations were high based on our experience aboard SV Sayang 2.5 years ago. You did not disappoint. In fact, you have set the bar even higher. There really is NO room for improvement! Many thanks from the Broadfoot family for a very memorable and enjoyable week on the Sayang! The sailing was a fabulous experience we felt very safe in your capable hands. Ratna, all your meals were excellent and we very much appreciate all your efforts to cater to our dietary needs. We will have fond memories of our week together. Sayang and you have been an unforgettable time, food, scenery, and adventure, and all 5 of us thank you for that! We have had a blast! You guys are colorful and interesting partners in life, and in a venture that requires hard work and patience, and on both counts you show passion for what you do! We thank you both for that , we had a great time on Sayang! 2/11/2012: What an incredibly amazing journey we have had! The natural beauty of the islands and the peacefulness of being on the Sayang has been such a fantastic experience. Thank you so much Ratna and Paul for all that you did, each delicious meal, each dinghy ride to a more beautiful spot, each sail, it was an absolutely wonderful time. You are the consummate hosts and so very very gracious! With great affection, Martha S.
We are back home in Italy. We had great time with Paul and Ratna on Sayang and would like to thank you very much for your advices. We could visit these wonderful islands in the best way. The boat is perfect as new with any comfort and perfectly clean. They are very kind and made us feel at home. At the same time they were very professional and very respectful of our privacy. Our daughters enjoyed a lot the holiday and loved to spend time talking with Ratna and Paul. Food was excellent, Ratna provided some good italian things such as for example salame, Prosciutto, caff Lavazza, pasta De Cecco, S Pellegrino water and, for the joy of the girls also one glass of Nutella. At the same time we had the chance to taste delicious dishes of asian, french and west indies cusine. Our feedback is excellent under any perspective. Thank you for a perfect week. You have shared your talents sailing, culinary and interests knowledge of each island and much more. We came as strangers and are leaving friends! Paul: it was a wonderful experience to be in the hands of a truly professional and competent captain. You know your boat and maintain it perfectly. Great fun. Ratna: What a marvellous culinary experience. I could not have imagined such wonderful food coming from your small galley. Thank you both for your friendship. Ratna and Paul! Thank you very much for a such wonderful time during our vacation. Everything was super! Your service and atmosphere is on a high level. Good luck for your business! Be healthy, happy and lucky!!! Dreams are made in our mind as we think in anticipation of vacations. Sailing in the BVIs has been a dream for 20 years. What you give are the realities of a vacation that surpassed even my dreams. The ability to deal with the unpredictable weather and wind and create a total experience that satisfies all on board is hard work and a great attention to detail. From the trips to shore, to the many snorkeling sites - from the snacks to the incredible culinary delights -from the local knowledge to the sharing of recipes - your smiles and hospitality made our trip special. You are sending home two very relaxed happy people. Our best. Thank you. It has been quite memorable and wonderful when Julie and I have been able to experience a vacation trip that has included visiting special places, enjoying great food and celebrating time with good friends. This past week has not only included all of that, it has exceeded all of our hopes and expectations and taken them to a whole new level. You both are very special people who invited us into your beautiful home, treated us like good friends and knocked yourselves out to custom tailor every day to make them the best they could possibly be. Please know that we are deeply appreciative. We could not have had a more wonderful week. We had such a wonderful time on the Sayang! Family memories were made on this trip. The food was wonderful. It has been such a treat not to worry about meals. We enjoyed having dinner on the top deck watching the stars. We cannot thank you enough for sharing the Sayang with us and your knowledge of the islands. There are many choices when chartering a yacht. Upon meeting you and seeing Sayang, I knew we had made the absolute best choice. Our needs were satisfied every step of the way. From first boarding Sayang to the final sail to Road Harbor, you were the perfect hosts. I will never find two more knowledgeable and engaging people in the BVI. Paul, a masterful sailor, was pleasant and patient answering my most rudimentary sailing and navigation questions. Ratna, an accomplished chef and first mate, crafted gourmet meals and deftly assisted Paul in sailing Sayang throughout the BVI without a hitch. You two are a great team. Thank you for a lifetime of memories. We came to you looking for a relaxing, yet active, vacation for us and our nephew. Your hospitality and accommodations far exceeded our expectations. We appreciate how eager you were to take care of us and our needs. We told you what we wanted to do and you arranged our trip to optimize our activities and enjoyment. We were very impressed with your professionalism, as well as your knowledge of the local area. The best advice we can offer to fellow travellers is to trust your judgment because you know the best way to work the trip to provide maximum enjoyment as well as relaxation. Thank you so very much for taking such good care of us. Sayang is beautiful and you both were a pleasure to spend time with. We look forward to our next adventure aboard Sayang. After my week long vacation with Paul and Ratna, I can hardly think of a better graduation present than a trip on the Sayang. Both of my hosts were extremely friendly and made me feel right at home. After delving into the heaven that is Ratnas lasagna, I knew I would be expertly catered to. Pauls quiet demeanor was further complimented by his inexhaustible knowledge of the BVI. It was an amazing trip and is one I will remember for the rest of my life. We wanted to relax, snorkel and see the rest of the BVI, and Paul and Ratna completely helped us to do this. They were patient and knowledgeable of all the places and surroundings. Sayang is a beauty and Patrick and I are so proud and honored to have sailed in such a boatand also cannot wait to tell the stories about it. The food was AMAZING and we only hope to experience such a vacation again in our near future. We loved the boat, the company and the BVI. Thank you so much! Many thanks for a wonderful trip! What a relaxing way to spend a week. We are honoured that you shared your home with us in such a welcoming way, and put up with us - teenagers and all. We wish you all the best in future sails, and hope to see you again. Boat was immaculate, all of the group felt totally safe all the time. Thanks for the flexible approach and helpful itinerary suggestions. Thoroughly enjoyed the whole experience. Ya all were great hosts! Very knowledgeable and personable! I enjoyed myself very much! Lots of laughs and delicious food! Wishing ya all the best! Thank you so much for all you have done for us this week. I had a wonderful time despite the weather. BVI is a beautiful place. Wish you guys the best and thanks again. It was a great week with the two of you. You were both excellent hosts and despite my stomach and health issues I had a wonderful time! Best of luck and I hope to see you in Cayman sometime! Thank you so much for hosting us in the most beautiful place on earth-what a setting for a fabulous week together. I can think of no better way to spend a week of Spring Break celebrating a childs high school graduation! This has truly been the trip of a lifetime. Ratna, every single meal was so delicious. Thank you for that. Im going to find crme fraiche as soon as I get to a decent grocery store back home. Paul, thank you so much for shuttling us in the dinghy and for putting the kids on the skis! Call us if you are ever in South Carolina! Thank you for taking us on our first BVI trip. We had a lovely and relaxing trip. You have a beautiful boat and we were in good hands. Thank you for the delicious meals and great restaurant recommendations. What a wonderful week we have had with Paul and Ratna on Sayang. We found Sayang to be more beautiful than we imagined and Paul and Ratna to be gracious and attentive hosts. We went to every anchorage we wanted to and even more! Loved the snorkeling, sailing, water skiing and hiking. A truly wonderful vacation for our family memory book! A perfect corner in the world? The week spent was treat after treat of island hopping. Captain Paul and First Mate Ratna took very good care to make this vacation a most memorable time. The Sayang speaks for itself pretty name, pretty boat and accommodating as well to all aboard. THANK YOU so much for a wonderful week. You guys are the best making us feel at home. Ratna, the food was the greatest and Paul thank you for the excellent sailing. This was one of the most amazing experiences of my life and a huge part of making that happen was due to the two of you! Fantastic views, food, sailing stories, it just does not get any better. Paul, thanks for the book recommendations! What a truly amazing adventure this has been. Sailing the islands, snorkeling, the hikes, etc. Your knowledge of the islands has made this trip. Paul your sailing expertise and Ratna your incredible meals combined with the sense of humor, compassion I could go on and on. The Sayang - a gorgeous boat - I was so lucky to be on board. Thank you both of you so very much!! Thank you for such a spectacular sailing adventure. You are very professional and made me feel safe in your capable hands. I loved all of Ratnas cooking, Pauls stories the beautiful boat, snorkeling and island tours. This was one of the most relaxing vacations I have ever had. You have fulfilled my Caribbean sailing dreams with reality. When I chose your boat for its beautiful looks, I had no idea the expertise that comes with it. You two have been fantastic on every level and I thank you for that. My trip has been the adventure I hoped for and the relaxation I needed. Thanks for an incredible week! I loved every minute of it. It was my first sailing experience and what an experience. You two made it very special and enjoyable. Watching you put the sails up and man handle those swells was impressive. The food was simply the best! Thanks for an excellent week of happy adventures! The little personal details made our trip - thanks for catering to our food allergies to start Enjoyed meeting Conrad and his cats, swimming off the most gorgeous beaches in the islands. Thanks for introducing us to the Baths, Ratna-great afternoon exploring and swimming off yet another perfect beach. Saw turtles, dolphins (Ratnas siting), pirate artifacts,musket balls with the imprint of human molars, the Queens BVI yacht and a sky full of stars. AMAZING. Afternoons of sailing with the rail in the water, spray in our faces and utter confidence in the captains skill and judgment. Incredible meals night after night. Perfect experience, perfect vacation. Next year? What a wild ride! Spectacular sailing in the safest of hands in the most beautiful of boats! There was sun, sea sand- and oh the wind! Thank you for showing us these islands, for sharing the luxuries of your boat-and for perfect evenings at the end of each exciting day. Delicious food and whatever drinks took your fancy that particular sundown. You did it all with effortless grace. As Arnold would say well be back! Thank you so very much for the most wonderful honeymoon. Joe and I will cherish our memories forever. We enjoyed every moment we spent on your boat: sailing, napping, chatting and EATING!!! Your food was amazing! Places you have taken us too, stories shared will always stay with us. It was our first sailing trip and we look forward to many more! We hope to sail again with you someday! We wish you wonderful guests, fantastic sailing and lots of great adventures. We will miss you and Sayang! PS Ratna, I cannot wait to cook all the great recipes you shared with us! You are an amazing chef! Thank you for taking care of us all week. Paul, thank you for making us feel so safe on your boat. You are a great captain and set the bar very high for our future sailing experiences! Having people to dinner and provide them a comfortable experience is one thing. Paul and Ratna take things to quite a different level. Great mealsamong the best I have experienced. Their home, the beautiful Sayang, is immaculate. They provide a tailored itinerary that provided an appropriate balance of activities and relaxation. However their real art is making their guests comfortable in their home. I dont know how they could have improved our experience. Wow! Thank you for the most wonderful week. Sailing, snorkelling, swimming, relaxing it was great. Of course this could have been had on any charter here but what we experienced on Sayang was far and above the normal charter! What a beautiful boat Sayang is meticulously maintained such a wonderful home for us this week. Paul - thanks for your patience with the novice sailors - you were so kind. Ratna how can we thank you for your warm, kind way you served us all week. I truly appreciate your hard work to make every meal special. No way we could have had a better chef! Most of all Thank you for taking us to special places, the Last Resort, Guana Island, they were truly special. We will miss you and we hope to be able to return again someday hopefully with our children. Good luck to you - your hard work has paid off - you have a beautiful thing going with Sayang. Thank you both. The week was spectacular. We have not relaxed like this in some time. Our lives will be in true Christmas form when we return. I havent seen Maureen this relaxed and smiling. THANK YOU. You welcomed us into your world, your home and embraced our family. Instead of feeling concerned about the windy weather, we felt secure and ready for the adventures you proposed. We are grateful for your kindness and wisdom, your humor and stories. Our boys could not have had a better first experience in the BVI and sailing. Thank you for the delicious meals(and deserts) your patience with our endless questions and for your calm, quiet, soothing manners. We loved our trip- we will miss you. Thank you so much for helping us have a great vacation! I loved getting to know both of you and learning about sailing and the islands. The food was great and you two were more than helpful. What can we say - absolute heaven. You have been so kind and caring and made sure on every level that we all had such a wonderful and memorable time. Your knowledge of the area and your willingness and generosity to share it all, makes this the most wonderful of experiences. We felt looked after all the time which made this a true holiday! Long, lazy days and new experiences during each one thank you! We cant wait to sail with you again and to hop back on to the Sayang. Our first sailing experience was amazing!! The food was wonderful and plentiful so many unique flavors Yum.Jerry and I especially loved the challenging sail through the storm 30 knot winds with the boat heeling over was a real thrill!! The snorkeling was awesome lovely coral colors and so many different kinds of fish. Another highlight was a trip on the dinghy in a sudden torrential rainfall to dine at the Last Resort. We arrived safely looking like drowned rats and enjoyed a great meal wrapped in towels. Pauls expertise at sailing and Ratnas culinary skills made this a memorable adventure for the both of us. Where do I begin? The trip was incredible! The boat Wow! We have never been sailing before and did not know what to expect. She is beautiful inside and out and the sailing was magnificent. You do such a great job maintaining every detail and she looks completely new. The service It was everything we expected and more! You looked after our family with such great care and attention to detail. It could not have been better. The food I am amazed that such great quality can come from such a small working area. You were so kind to provide 3 meals each and every day and they were delicious and presented with 5 star restaurant quality. All together these things with the beautiful Caribbean cannot be matched. Thank you for making this trip so memorable! Peruvian fish ceviche served with patacones (plantain chips) fresh salsa and guacamole. Fresh tossed salad served with a balsamic reduction glazed chicken, avocado and homemade bread. Mariners Mussels in a creamy coconut and parmesan sauce. Classic Spanish tortilla with a light side salad. Couscous with feta cheese, spinach and asparagus wrapped in bacon. Creamy pumpkin soup served with fresh homemade bread. Goulash served with Jasmin rice and fresh salad. Pan seared ribeye steak drizzled with a fresh mushroom sauce, crispy potato and coleslaw. Brazilian Moqueca – Fresh fish cooked in a coconut curried sauce with veg and basmati rice. Rack of lamb served with sauté vegetables, mashed potato and mint sauce. DIY Fish/Chicken tacos - to die for!!! Crispy fish balls served with rice and sauté vegetables accompanied by a truffle mayo. Sesame crusted tuna steak with a creamy lemon sauce. Sayang has a fully stocked bar, please don´t be shy to send us your special requests or favored brands so we can make sure to stock them.